← How to Clean Up 2nd Hand Skates and Keep them Looking NEW! Diary of a Dryerless Dame: Sunny & Cold! 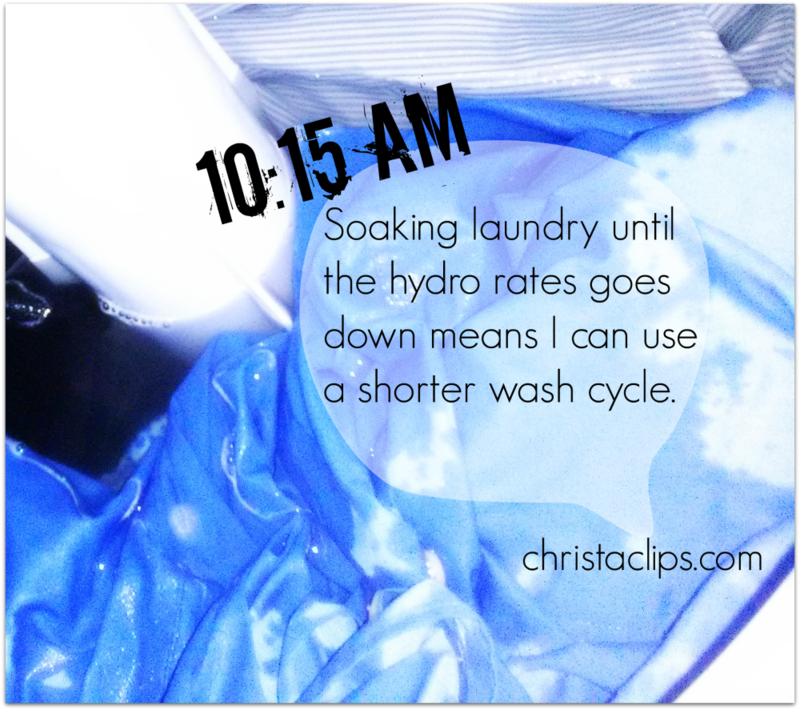 Christa Clips: Save-at-Home-Mom puts laundry to soak first thing in the morning and waits until the RED ZONE is finished before starting the washing machine to SAVE on hydro. Filling our top loading washing machine takes little (if any?) electricity so I fill it with water first thing in the morning, add soap, stir with a long handled spoon from the dollar store and add clothes to soak until I put down the lid to start the cycle when hydro rates change from RED ZONE (on-peak) to YELLOW ZONE (mid-peak) rates at 11am. Ideally we’d run the washing machine during the time-of-use GREEN ZONE from 7pm-7am but I find that the clothes are too wrinkled if I leave them overnight and I just don’t have time to hang them until the kids get on the school bus at 8:30. I figure the fact that we’re paying mid-peak time-of-use hydro rates is more than offset by the fact that we don’t run a dryer. No wind-chill factor?! That’s rare! Indoor drying is the only option on these calm and cold days unless you like jeans-icles! As soon as I saw that there’s no windchill today, I knew I’d be drying my load of laundry indoors. 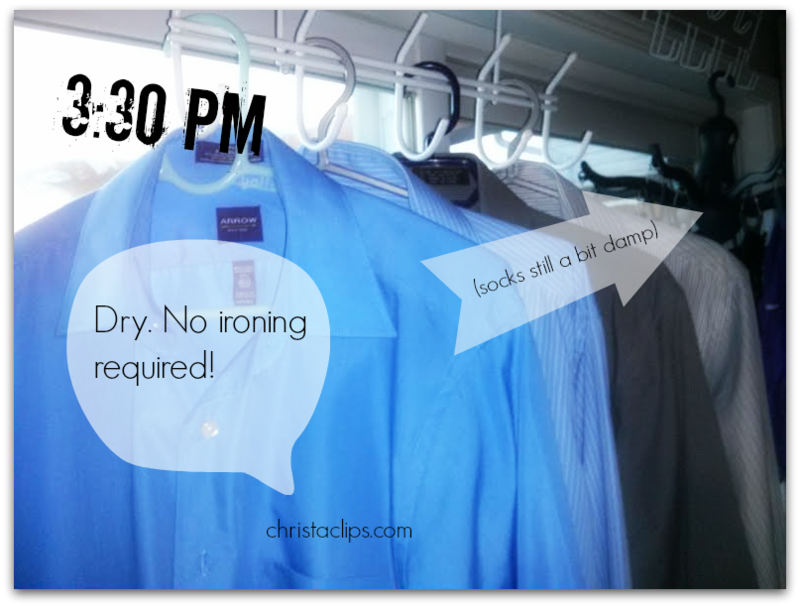 Not a problem – I’ve got some great drying gear and a super indoor system! Harnessing the heat from the afternoon sun in our west-facing patio doors, combined with the floor heat vent make for ideal air-drying conditions! 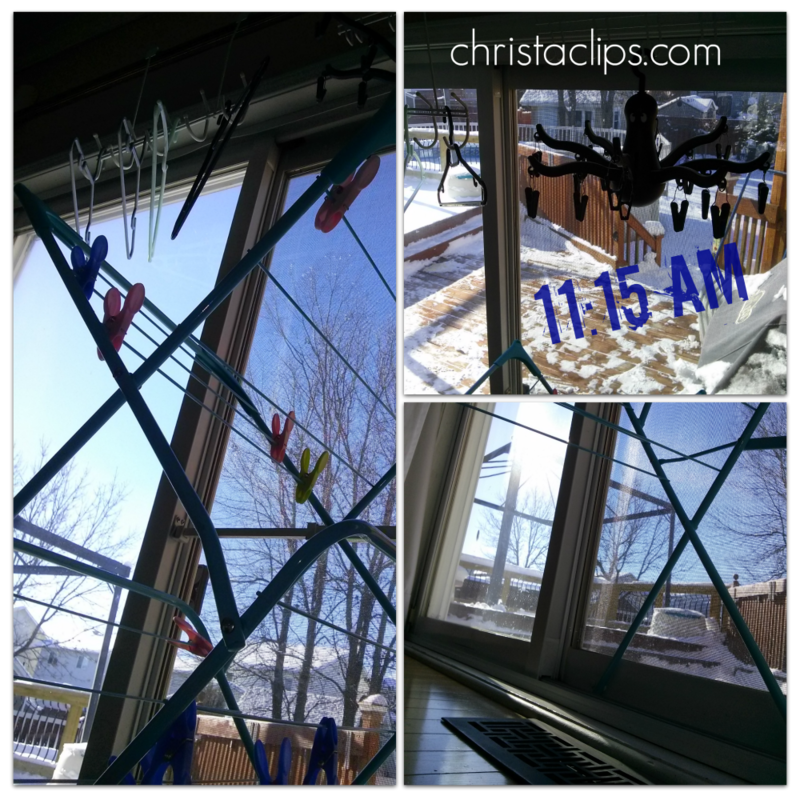 While the wash cycle was running, I set up my drying rack and hanging gear in front of our south-west facing patio door over the heat vent. The sun pours through from 11:30-3:30ish at this time of year and is more than enough heat to dry most clothes and even towels. Dress shirts go directly onto hangers, socks & undies onto the octopus/spider thingy from IKEA and I love these tall slender drying racks from Canadian Tire to trap the warm air from the air vents. Giving the dress shirts a quick snap-like shake and getting them onto hangers straight out the washing machine usually gets out all of the wrinkles for us. No ironing? Yes, please! The sun shone all afternoon and the dress shirts were dry and wrinkle free by the time the sun dipped behind the neighbour’s roof at 3:30, as were the yoga pants, cotton t-shirts and pj bottoms! I sure am looking forward to when the days get a little longer in December – even JEANS will dry in a day when we have 5 straight hours of sunshine! The socks and undies were still a little damp and I moved the spider hanger to the bottom of the drying rack to catch some serious air until 5:00! Dryer free living is totally do-able! Everything was dry, folded and put away by dinner time. The drying racks & gear all have a place in the laundry room (we just did a mini upgrade – pics in an upcoming blog post!). Our 10 month dryer costs are holding steady at $3 (from that “i’m flying to Cuba tomorrow” underwear emergency!) and I really feel like I’ve finally got a handle on the weekly ebb & flow to ensure that we’re not surrounded by drying racks in the evenings and over the weekend. Dryer free living is totally do-able! 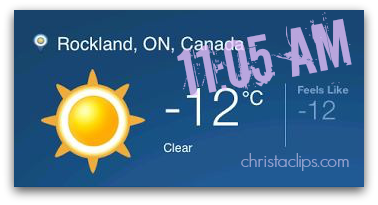 Posted on November 29, 2013, in Christa Clips, Hydro Savings, Laundry Tips and tagged Christa Clips, Diary of a Dryerless Dame, Dryer free living, how to save on laundry. Bookmark the permalink. Leave a comment.